News today is breaking that the admin for the Bitcoin exchange BTC-e has been arrested for money laundering. 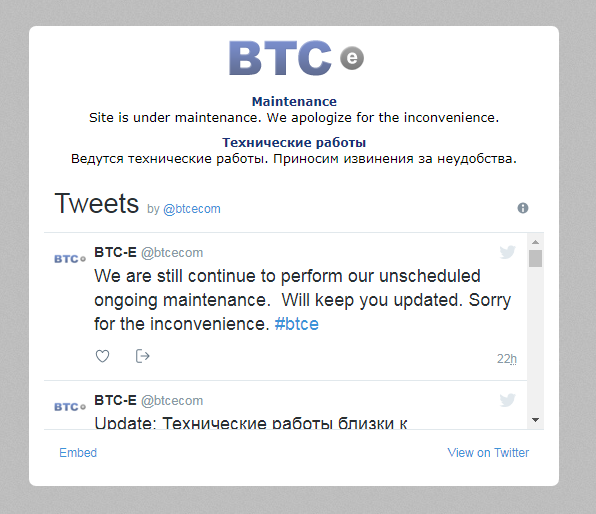 Things started yesterday when BTC-e took down the entire exchange saying the site is under unplanned maintenance, as pictured below. Shortly after people on Twitter began to further speculate something was wrong, when tweets starting showing up about 66,163 bitcoins (worth $161,298,777 at the time of this writing) were being sent from the BTC-e exchange’s cold wallet. A Russian national arrested in Greece on Wednesday on suspicion of laundering criminal funds by switching them into bitcoins is a key person behind the BTC-e crypto-currency exchange. Police sources identified the man as Alexander Vinnik, 38, who was arrested in northern Greece on a U.S. warrant and is accused of laundering at least $4 billion. Yesterday after a surprise operation he was arrested and today he was handcuffed to the prosecutor of the Thessaloniki Court of Appeals in order to start the proceedings for his extradition to the United States. The Daily Thess also said allegedly that a large part of the BTC-e bitcoin was sourced from Mt. Gox in 2014 after they were hacked and immediately shut down, suggesting that BTC-e administrators were at least in part behind the Mt. Gox hack. It’s unclear at this time what will happen with the BTC-e Bitcoin exchange, as so far it has yet to resume operations and it’s possible that the remaining admin(s) may not open the operation back up; which means that anyone that has funds on the exchange could possibly lose them to the admins or through the authorities shutting it down in the near future. This is also yet another reminder to not hold your funds on a Bitcoin exchange unless you are an active trader. Always store them on your own personal wallet that you have the private key to.